This batch was a favourite of mine. The Saro body looked so much better than many contemporary offerings. 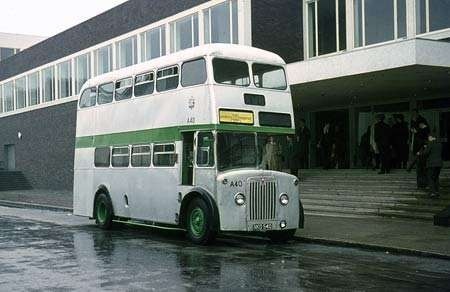 These were sometimes to be found on East Midland route 99 Chesterfield to Sheffield via Ford and Ridgeway. This picture is in the maroon livery but they looked even better in the chocolate, biscuit, and cream livery. Seeing the caption to this one has prompted me to look at the East Midland entries in the column on the left. Yes, the chocolate and cream style was distinctive. 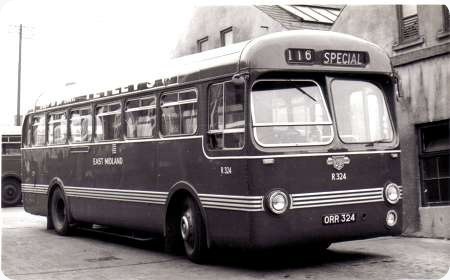 My only experience of Tiger Cub/Saro buses was with Ribble. I note some comments about migrating managers who took their old operator’s livery with them. Readers will know that Southampton’s traditional dark red – cherry might be the simplest way of describing it – was supplanted on the Atlanteans with much more cream, and a lighter red. Bill Lewis brought that arrangement with him from Manchester. The Saro bodywork was a much more good looking version of the BET specification which spawned thousands of MCW Hermes bodies that took a number of iterations to look only half as attractive. Interesting to note that probably the three largest fleets of these Saro/Tiger Cubs, Ribble, East Midland and NGT all ended up in unrelieved dark red/maroon livery. Even so they still looked smart. Interesting too that, to the best of my knowledge, this type of body was never built on a Reliance. One type that did share the body was the SARO Integral which was Gardner powered which appeared around 1953. It ended up with Berresford Cheddleton who ran it in a livery that looked very similar to PMT between 1966 and 1968 with the fleet number 28. …and preserved Guy LUF SARO demonstrator LJW 336! Very similar bodies were fitted to BUT trolleybuses for Dunedin and Auckland New Zealand (the nearest we get to a Reliance?) and less similar, less attractive, 33 ft long Daimler Freelines also went to Auckland, the first as a complete build, the rest – 89 in number – ckd. Though looking different due to the panelling I gather the framing was the same. Here is a shot of LJW 336, the Guy Arab UF demonstrator which was subsequently purchased by Blue Line of Armthorpe. This view shows it in 1969 at which point it had been just a store for a number of years. It seems surprising that it was on the heavier UF rather than the lightweight LUF chassis. Since posting my shot, I have found a number of views of LJW 336 in preservation, which refer to it as an LUF. I took my information from the PSVC fleet history PB4, which lists it as a UF. This is what also appears on the SCT61 site that Phil refers to. However, I have been back to my copy of PB4; this includes the PB4A appendix, which I had overlooked first time round. This corrects the original info and lists it specifically as an LUF. Alan, that makes a lot more sense though the Freeline as hardly a lightweight. LJW 336 was a special Guy Arab UF which was developed as a test bed for lighter construction. The result of this development was the Arab LUF, for which LJW acted as a demonstrator. 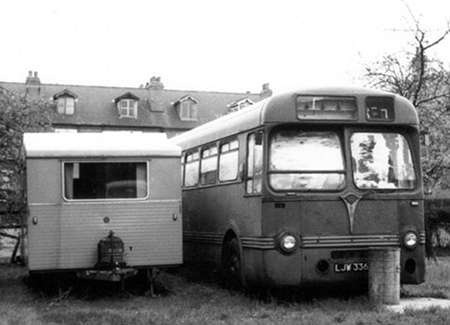 The only objection to calling it an LUF is that the LUF hadn’t actually been invented when it was built! I’m not sure about Manchester being the inspiration for Southampton’s new livery. Bill Lewis may well have taken the lighter red with him, but I think I’m right in saying he left Manchester before the Mancunians arrived (I was working under him at the time), and in any case the Southampton scheme doesn’t bear much resemblance to the Mancunian livery. However, I remember Ralph Bennett exhibiting a Bolton Atlantean to the Manchester public before then, and to my eyes the Southampton livery looks like the Bolton scheme with Manchester colours. Peter, you may well be correct about the origins of the Bill Lewis style of Southampton livery. I suspect from what you say it is something of a hybrid: Bolton style so far as ‘what colour is where’ is concerned, but using the brighter Manchester red. It wasn’t just the Transport Department managers who had this idea of taking their old liveries with them: the then City Engineer in Southampton had come from Swindon, and brought that Council’s shade of blue with him. During the late 60s/very early 70s I was working in the Birmingham area but visited my folks in Nottingham most weekends. On fine Sunday mornings, I liked to borrow my Dad`s camera and trundle around the likely photo-spots in the city and here is one from that era. 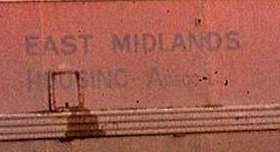 Obviously by then operated by East Midlands Housing Association, it occurred to me that its previous "East Midland" fleet name had been neatly over painted in black with the extra "S" on the end. One letter overlaps into the bay in front, but two into the bay behind. By now looking a little tired and work-stained, it nevertheless attracted my attention as a handsome machine worthy of recording, sadly not enough to note the date and reg number. Trent had 10 of these Saro Tiger Cubs. painted red below the waist rail white above and looked superb probably the best colour scheme of all. A couple ran in wales for a long time. I saw a photo of some Reliances with a similar body that were exported to the Caribbean. 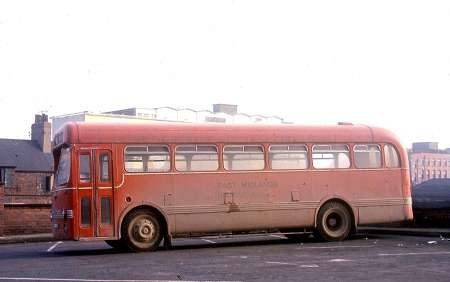 Reading this column on Saunders Roe bodied Tiger Cubs, I was employed by Ribble at Carlisle depot 1963 to late 64 where there were at least 5 such buses including the two allocated to the 603 Bowness on Solway outstation. I occasionally got to drive one on other rural routes plus I was allocated one to operate an evening excursion to Appleby Horse Fair. I liked these buss with their light steering and gearboxes that needed skill to make a clean change, they were rather underpowered for hilly rural routes ie Carlisle to Hesket New Market climbing Warnell Fell, once down itno 2nd gear just above Goose Green pub there was no chance of ever getting back into 3rd before cresting the long drag due to the long delay in waiting for the revs to drop. 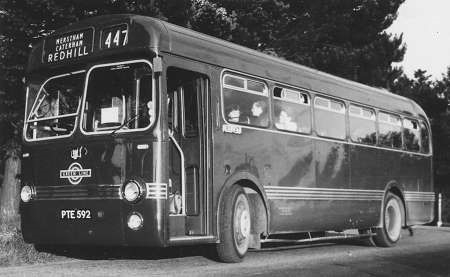 Attached is an official Saro photograph of an Auckland Transport Board Royal Tiger with Rivaloy body given to me by Saro after a request for information about the company back in the 1950s when I was a teenage bus enthusiast. I note a recent announcement by Oxford Diecast Models that they have produced a Saro bodied model of a prototype in London Transport Country Bus livery. Did LT ever take delivery of such a vehicle because it is the first I have heard of this? Possibly it might have been a demonstrator? David Revis asks if any Saro bodies were made for London Transport. The production summary at the back of the book ‘Saunder-Roe, Builders of the world’s lightest buses’ shows that NO single-deckers were built for London. From 1946-1956 there were 272 for the home market and 1246 for export. 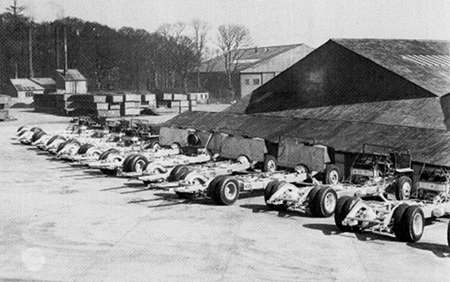 Of 376 double deckers built 300 were for LT. I assume that the model is presented as LT just to maximise sales with little regard for reality? In 1953, following the completion of the RF delivery programme, London Transport was looking at future options regarding lightweight single deckers. 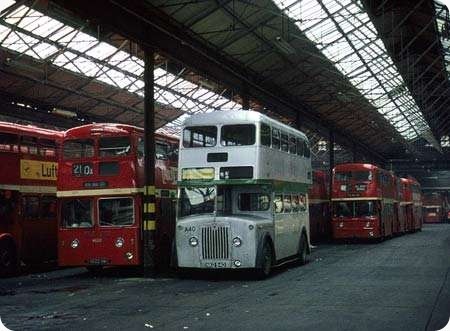 ‘Buses of London’ by Colin H Curtis published by London Transport tells that three experimental models were obtained which were an Eastern Coachworks bodied Bristol LS5G (PHW 918), a chassisless AEC Monocoach with Park Royal bodywork (NLP 635) and a Saunders-Roe bodied Leyland Tiger Cub (PTE 592). 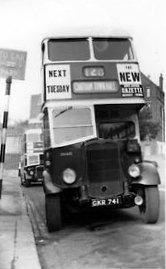 The text reads: ‘All were allocated to Reigate garage for extensive tests on route 447 and 711. At the end of the test no decision was made and the vehicles were returned to their owners’. Chris H, David S, Les D: Thank you all for your responses. The thought did go through my mind that Oxford might have produced the model by way of artistic licence as Les inferred. It was a relief to learn that Oxford was completely ethical and had obviously done their homework. Here is a photo of PTE 592 whilst in service with London Transport on the 447 route.